Arrival of Deng Xiaoping's plane at Andrews Air Force Base. Greeted by press and onlookers, some holding signs and banners in Chinese. A case study of the dynamics of nuclear proliferation: China triggers India and India triggers Pakistan in the competition to have their own nuclear weapons. 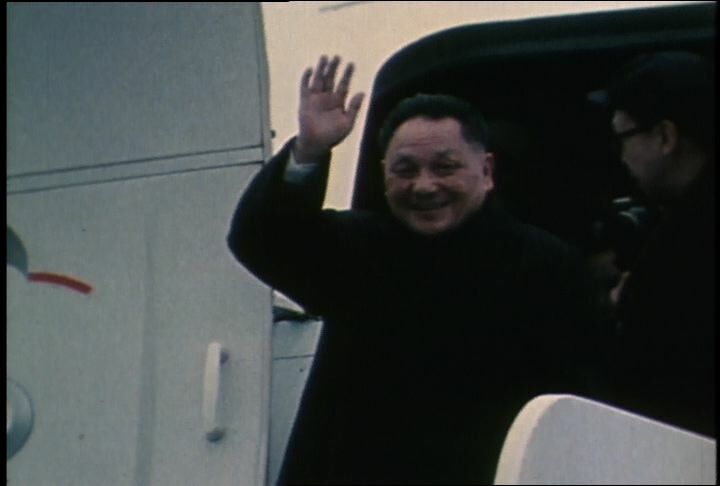 Chicago: “War and Peace in the Nuclear Age; Haves and Have-Nots; Deng Xiaoping Arrives at Andrews AFB,” 01/29/1979, WGBH Media Library & Archives, accessed April 25, 2019, http://openvault.wgbh.org/catalog/V_7F39E138353E4AB0997C4B85BAB58307. MLA: “War and Peace in the Nuclear Age; Haves and Have-Nots; Deng Xiaoping Arrives at Andrews AFB.” 01/29/1979. WGBH Media Library & Archives. Web. April 25, 2019. <http://openvault.wgbh.org/catalog/V_7F39E138353E4AB0997C4B85BAB58307>.